U.S. Flag Store's Maine State Flag is printed in America on Nylon flag fabric. Since this flag is made in America, U.S. Flag Store is able to ensure that the complex State emblems are printed with accuracy, sharp detail and bright colors. This outdoor Maine State Flag is finished with the same high quality materials as all of U.S. Flag Store's US flags, and is extremely durable and long lasting. Design: A blue flag with the Maine State Seal placed in the center. The seal includes a circle containing images of land, the sea, a moose, and a pine tree. On one sides of this circle is a farmer with a scythe and on the other side is a sailor resting on an anchor. Above the seal is the state motto "Dirigo", which translates to "I lead", and above the motto is the North Star. Finally, below the state seal is the text "Maine". Meaning: The pine tree, a White Pine and Maine's state tree, has been a sign of American Spirit since the early days of the American Revolution. In front of the Pine tree is a moose, and together they represent the importance of flora and fauna to the state of Maine. The sailor represents seafaring and commerce, and the farmer signifies the importance of agriculture in Maine. In 1820 Maine became the 23rd state of the union, but the state would not adopt its first official flag for nearly 90 years. 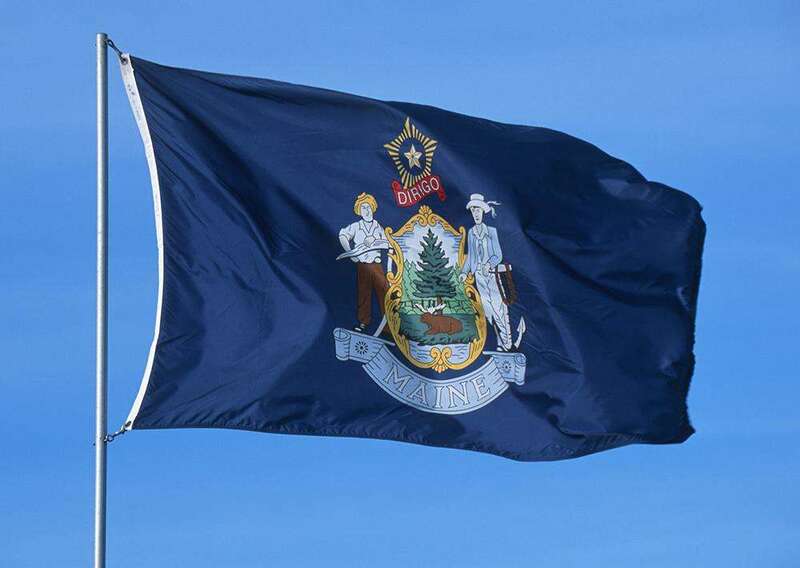 Maine adopted its first flag on March 21st, 1901. This flag featured a pine tree and a star on a field of beige. A few years later, on February 23rd, 1909, the Maine Legislature officially adopted a new flag design that incorporated the seal of Maine. There have been two bills, in 1991 and 1997, which have proposed that Maine revert back to its original state flag design. However, both of these bills failed to pass through the legislation and the current flag of Maine is the same as the one that was adopted in 1909. The Great Seal of Maine was officially adopted in June of 1820, the same year that Maine was made a U.S. state. The seal was designed by Colonel Isaac G. Reed, who followed New England tradition and incorporated a Pine Tree as a symbol of American spirit and fortitude. The seal features a moose resting in the shade of the pine tree, a farmer, and a sailor. It also features a banner with the state motto "Dirigo" or "I lead" on it, the North Star, and the state's name placed at the bottom of the seal.